"Refreshing and easy. The subtle fennel flavor classes up an otherwise average summer picnic dish. It's cole slaw for those who don't usually like it! Save some fennel leaves for garnishing. Especially delicious with grilled tuna steaks." Whisk apple cider vinegar, triple sec, and salt together in a salad bowl, stirring to dissolve salt. Toss green cabbage, purple cabbage, fennel, and onion in the dressing until coated. Chill for at least 30 minutes. 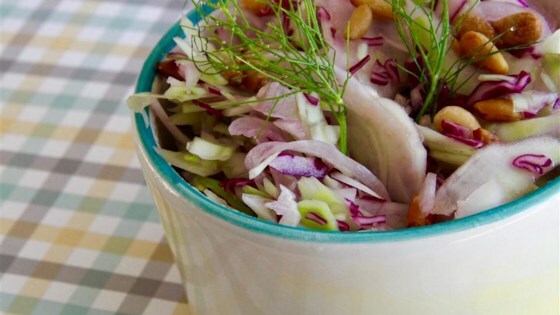 Sprinkle slaw with pine nuts to serve. We loved it! Used half of a red cabbage and one fennel bulb but kept everything else the same. Delicious! Will make this again!